A little Parmesan cheese brings this dish together. 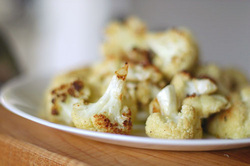 Place cauliflower florets in a 9"x13" baking dish. Sprinkle with garlic, lemon, oil, and salt. Toss. Bake 25-30 minutes, stirring occasionally.